Contact the brewery to arrange an evening tour. Lasting about 90 minutes, you'll start with some background on the estate and the science and art of brewing. Claire the brewster will guide you round the bijou brewhouse, set in a converted barn, before you finish with a few samples to taste. The Welback Farm Shop carries the brewery's beers as well as a vast array of local foods, including the estate's Stichelton cheese. 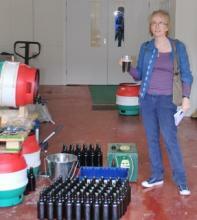 Welbeck Abbey Brewery would be happy to consider visits from schools, colleges or universities. It will be acting as host for a number of students on the University of Sheffield Masters in Brewing course doing their placements. Welbeck Abbey is a majestic estate in Nottinghamshire – think Robin Hood country – with historic roots stretching back to the Domesday Book. Following several hundred years as a monastery, the grand house became home to a succession of earls and lords, until it was leased to the MoD as an army training college after the Second World War. Still in private hands, the estate took a new direction in the mid-2000s, creating the ambitious Welbeck Project, a quest to create a sustainable community "through rural and creative industries, education and the arts". With butchers, bakers, cheese makers and the School of Artisan Food now occupying converted farm buildings, the newest tenant is Welbeck Abbey Brewery. Developed in a partnership with Sheffield's legendary Kelham Island Brewery, and built with support from the East Midlands Development Agency, the beers are in the capable hands of Claire Monk. Formerly a microbiology graduate, she had been working at Kelham Island when the project cropped up. Her first brew gives an idea of her leanings, with a good dose of West Coast hops added to water from Welbeck's own water supply. The second, the Feathers – with its label inspired by the Welbeck's family crest – is brewed with all English ingredients. Links are in place with the new Masters of Brewing course starting at University of Sheffield such that a few of the students will spend their placements with Claire at Welbeck Abbey Brewery. Water usage – minimised in both in water used for brewing and for cleaning, eg final rinse water for casks used as pre-rinse for next cycle.